The whole A/G team is back from the week of Greenbuild 2018. The event was hosted in Chicago, Illinois this year and did not disappoint. There was snow, skyscrapers and lots of pizza! The International Summit consisted of a day of sessions that reminded us how sustainability and resiliency are not just a local issue but a global conversation that requires everyone has a seat at the table. During the opening plenary, two inspiring UN Youth Leaders discussed how they are making a direct impact to their communities on a local and global scale. After witnessing the large BP oil spill back in 2010, Karan Jerath invented a device designed to help minimize the immediate effects of an oil spill for his high school science fair. The device works by separating oil, water, and gas as homogeneous mixtures allowing for them to be recycled immediately after a spill. He now attends University of Texas where he studies engineering. Nikki Fraser serves as the Youth representative from the British Columbia Native Women’s Associations and the National Youth Representative for the Native Women’s Association of Canada, advocating for the voice of Native women in the northern region. She works to not only create conversation between indigenous women about social and environmental justice, but she makes sure their voices are heard in conversations around the world. As UN Young Leaders for the Sustainable Development Goals both Karan and Nikki advocate for the 17 Sustainable Development Goals set and adopted by UN countries to end poverty, protect the planet, and ensure global prosperity. They left the crowd both inspired and in awe of how one individual with a passion, at any age, can incite change throughout a community and beyond. The day ended with a combined closing plenary with all the summits of the day; International Summit, Communities and Affordable Housing Summit, and the WaterBuild Summit. USGBC took the chance to announce some of its new partnerships and collaborations. Read more about all these announcements at USGBC. LEED for Transit – USGBC unveiled its new rating system designed to be used on transit stations worldwide. USGBC and Health Product Declaration Collaborative (HPDC) – Bringing further transparency to building products and material ingredients. USGBC and BRE – Partnership to deliver global market solutions to help raise sustainability standards globally. LEED v4.1 credits for BD+C and ID+C. Living Standard – New platform created by USGBC to share stories of sustainability and innovation to incite collaborative impact. Check out more about it here. The opening plenary for Greenbuild hosted Amal Clooney as keynote speaker. As a human’s rights lawyer and professor at Columbia Law School, Amal spoke of various legal cases she has sat on and how human rights go hand-in-hand with sustainability. She helped to kick off the three-day conference by bringing the green building industry to a human scale and illustrated how fighting the impacts of climate change is fighting the inherent impacts to human rights and well-being. She spoke to one case in particular about Nadia Murad. Nadia was taken as a slave to serve ISIS militants in Sinjar of northern Iraq. After escaping and residing in Germany as a refugee in 2015, Nadia began a campaign to raise awareness of human trafficking. Since then she has been advocating for victims and the prosecution of ISIS, being awarded with the 2018 Nobel Peace Prize. Amal spoke of the case and how Nadia’s commitment to speak out against her captures has since saved countless women. Her story echoed the idea of how one person with a passion can make a great impact of change on a large scale. 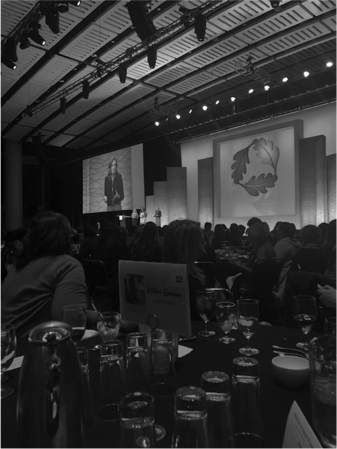 Women in Green always ranks as one of the best sessions of Greenbuild, and this year was no exception. The theme for the luncheon was “Leading with Purpose” using iconic women in television to drive the conversation in representation and leadership, mentorship, workplace policies, and workplace culture. Jessica Grounds, the founder of Mine and Gap helped to lead the discussion using her experience working with industries and organizations to create the tools to harbor gender-inclusive environments. Instead of a panel this year, she facilitated questions that evoked conversation about the current gender equality at companies, how they can be better, and what steps can be made to achieve those goals. Women used the “soap box moment” to share these conversations. Daniele Horton, founder of Verdani Partners, ended the luncheon on the soap box explaining “we should not have to dress like men and act like men to be treated with the same respect as men,” and how a dialogue between women AND men is needed to make a cultural shift in the workplace. Following the amazing performance by Buddy Guy and the Celebration at the Fields Museum, A/G added another year of cohosting the Reviewers Party at the House of Blues Chicago! The last and most notable session for Greenbuild 2018 was the Closing Plenary. It hosted various speakers including the Mayor of Chicago, Rahm Emanuel, who was presented with the LEED Platinum for Cities for Chicago by Mahesh Ramanujam and the rest of USGBC. The city of Chicago is already 40% towards its Paris Agreement goals and has plans to further reduce emissions and continue its drive to retrofit and build green buildings across the city. But the keynote speaker was by far the most memorable conversation (by popular opinion) for the Greenbuild conference this year. 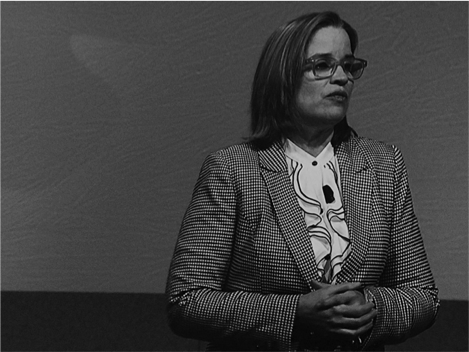 Carmen Yulín Cruz, Mayor of San Juan, Puerto Rico, came with a message that put all the sessions of Greenbuild into a vary tangible and real conversation. “You are in the business of saving lives. If you do your job, lives will be saved.” Over 3,000 people died in Puerto Rico following both hurricanes of Irma and Maria in 2017, due to a lack of power and access to clean water. Response from outside parties was limited causing the island state to remain in the dark and without basic necessities for an extended period of time. When help was brought, two simple items made a large impact on the community. The SolarPuff brought small rechargeable lights that could allow people to see in the dark for first time ay night, while also creating a system of communication with the different lighting features i.e. blinking for immediate assistance. The second was a water purifying system called Clarity by Kohler. Clarity allowed large groups in shelters and emergency centers access to clean water, something typically taken for granted. The mayor went on to say how “sometimes we feel like we have to do these grand gestures to help. This is about saving lives. It's not about politics. It's about having the ability to have a product to change people's lives and ensure that they change their’s too.” If these small items can make such a difference for the large communities effected in Puerto Rico, people attending Greenbuild can create profound changes with the work they do every day. The conversation in the green building sector has changed. We as ‘movers and shakers’ in the community are not trying to sustain what we already have, but instead preparing for the adaptability of the unavoidable changes that are going to come. Greenbuild 2018 attendees came in with hopes of learning new technologies and big ideas to apply to the green building industry, but left with this empowering idea of how one person with an idea and a passion can invoke change on a large scale. Excited to see what Greenbuild 2019 brings to the table…See you in Atlanta!